Each year on Labor Day our State of Working North Carolina report details the economic conditions and trends that face North Carolina’s workers. This year, in addition to focusing on these conditions and trends today, we also delved deeper how the current lack of jobs and the growth of low-wage jobs will impact the state’s economic future, particularly given demographic trends in the state. In the face of high unemployment and labor market outcomes that are pushing African-Americans in particular further behind, an interesting trend has emerged. In the nation as whole and North Carolina, African-American workers have demonstrated resiliency in their connection to the labor force. The unemployment rate for African-Americans remains much higher relative to whites, growing by 4.6 percentage points from 2007 to 2013 compared to a 2.7 percentage point change over the same period for whites. And yet, African-Americans have been much less likely to leave the labor force altogether despite weak job prospects. The labor force participation rate changed from 2007 to 2013 for African-Americans by 2.6 percentage points while dropping far more for whites by 4.2 percentage points. The labor force resiliency of African-American workers is contributing to the persistent difference in unemployment rates between African-Americans and whites. But on the positive side, when jobs return, it could also position African-American workers for faster re-employment. 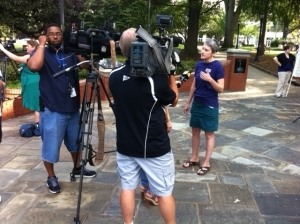 MaryBe McMillan of the N.C. AFL-CIO answers questions from some of the reporters in attendance prior to this morning’s rally in Raleigh. About a hundred people gathered next to the Fallen Firefighters Memorial in downtown Raleigh this morning for a rally/press conference to help kick off a three-stop “#TalkUnion” tour that is being by state union and civil rights leaders. The tour will also feature a noon event in Greensboro at the Beloved Community Center at 417 Arlington Street and conclude with a 5:30 p.m. rally in Charlotte’s Marshall Park at 800 east 3rd Street. All are invited. The event in Raleigh featured Rev. William Barber of the North Carolina NAACP and state AFL-CIO Secretary-Treasurer MaryBe McMillan as well as rank and file workers and leaders from the local faith community. All spoke of the desperate need in North Carolina to raise wages for average workers and to halt and reverse the conservative policy agenda of the state’s current political leadership. The claims of the various speakers were boosted this morning by the release of the latest “State of Working North Carolina” report by experts at the North Carolina Justice Center. Almost six out of every 10 new jobs created since the end of the recession are in industries that pay poverty-level wages, keeping workers trapped in poverty even when they are working full-time. The growth in low-wage work is disproportionately impacting workers of color and women: 13.2 percent of women, 13.5 percent of African-Americans, and 23 percent of Latinos earn below the living income standard, compared to 9.7 percent of men and 9 percent of whites. The persistence of higher unemployment rates for African-Americans is in part being driven by the greater labor force resiliency of African-American workers. Since the recession, African-Americans have not dropped out of the labor force at the same level as white workers. There are approximately 260,000 North Carolina working families who live in poverty, with 12.8 percent of working families earning poverty wages. 13 of 14 metro areas saw labor forces decline since June 2013. For eight metros, the decline in unemployment was driven by the unemployed moving out of the labor force rather into jobs. Rural employment dropped 2.7 percent since the start of the recovery while the state’s large metropolitan areas have seen 6.5 percent job growth. Click here to read the entire “State of Working North Carolina” report. Today is EITC Awareness Day – also referred to as the Earned Income Tax Credit (EITC). The EITC is a federal tax credit that encourages work by boosting the income of low- and moderate- income working people and offsets federal payroll and income taxes. The EITC has proven to be a powerful tool in helping lift families out of poverty and improving the well-being of young children. In 2007, a state EITC was established to help further boost the wages of low- and moderate-income workers in North Carolina and offset the higher share of state and local taxes they pay as a percent of their income compared to high-income workers. More than 900,000 North Carolinians claimed this tax credit in 2011, according to the most current tax information provided by the NC Department of Revenue. The impact of the EITC spans across the state, with taxpayers in each of the state’s 100 counties claiming the tax credit (see this interactive map). Unfortunately, this tax filing season will mark the last year that low- and moderate-income North Carolina workers will benefit from the state EITC. State leaders allowed the state EITC to expire at the end of last year and chose not to extend the tax credit as part of the tax plan passed last year. As a result, the expiration of the state EITC represents a tax increase for more than 900,000 hardworking low- and moderate-income North Carolina taxpayers, for which every dollar counts in their efforts to make ends meet.